What was an illegal dump on our Harlem River is now in its 7th year as thriving wildlife refuge and public gathering space. Help continue this tradition of community cleanup and environmental stewardship. Please join MWW’s US EPA award winner "James "Birdman" Cataldi, Friends of Sherman Creek’s Obed Fulcar, Riverkeeper and our co-sponsors NYS Senator Adriano Espaillat NYC Councilman Ydanis Rodriguez. Special thanks to MTA, New York Restoration Project and the Wildbird Fund Youth education activities include boat-building, environmental justice & citizen-science. Learn more about what's living in Harlem River? Work on oyster reef starting w measuring oysters growing in cages. Meet your neighbors and help build community. Enjoy food & music. Raffle, giveaways, light lunch while supplies last. 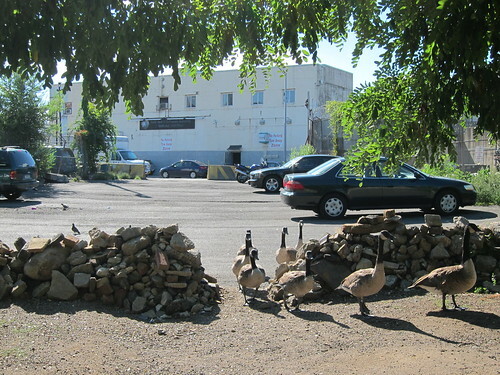 Make a big difference to Inwood's environment & wildlife! email James@NYCWetlands.org or call 347-360-1227. Lo que fue un vertedero ilegal en nuestro río Harlem, es ahora en su 7mo año un refugio de vida silvestre y un espacio de reunión pública.Ayuda a continuar esta tradición de limpieza y protección ambiental de la comunidad. y ciencia cívica. Obtenga más información sobre lo que está viviendo en el río Harlem. Trabaje en comenzar arrecifes de ostras, midiendo el crecimiento de ostras cultivadas en jaulas. Conozca a sus vecinos y ayude a construir comunidad. y Es hora de marcar una gran diferencia en el medio ambiente y la vida silvestre de Inwood! *Se recomienda usar zapatos resistentes o botas de trabajo y mangas largas. Oportunidades limitadas de patrocinio empresarial y de participación escolar disponibles. 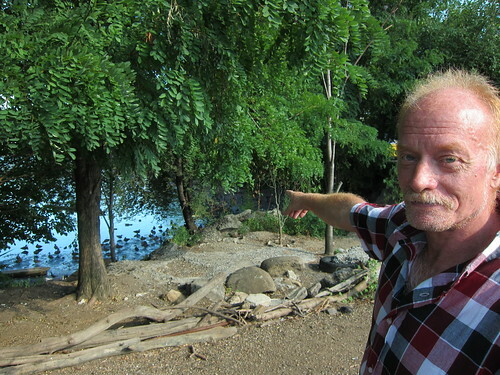 Two years ago, WaterWire published a story about James "Birdman" Cataldi, who singlehandedly transformed a polluted cove on the Harlem River, where he had discovered a few sick geese picking their way through shards of broken glass, into a thriving natural spot to which birds -- and the community -- were returning. Mr. Cataldi was honored in 2012 by the Environmental Protection Agency for this work. Read the story here and check out a wonderful video about Mr. Cataldi here. What was once an illegal dumping ground is now a wildlife sanctuary and community gathering place. Mr. Cataldi continues to work hard at the restoration and community outreach. On Saturday, September 27, his organization, the Manhattan Wetlands and Wildlife Association (which is affiliated with Conservancy North), is sponsoring a two-part event -- a shoreline cleanup from 10am to 3pm, and a music festival from 3pm to 9:30pm. There will be food and crafts, talks on biodiversity and educational activities for children. 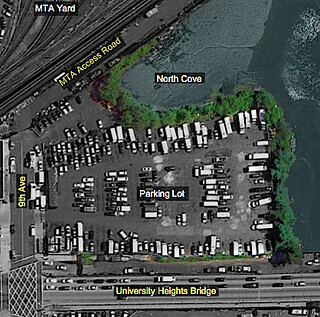 To get to North Cove, walk through the parking lot off 9th Avenue just north of 207th Street in Manhattan. Mr. Cataldi calls this work a multi-generational responsibility. He hopes for a big turnout on September 27. "As we continue our tradition to service our community, people from all walks of life are coming together and celebrating our great natural resources, learning more, and helping out," he wrote. "It is important our community sees how much progress has been made, that people stopped dumping garbage because people started to care." Like a Pasture who protects the land so the sheep have healthy and safe ground upon which to eat and live - Stewards of a Wildlife Sanctuary must protect the land, for healthy wildlife to grow, thrive. Inwood's North Cove must bee nursed back to health since this remnant of estuary has been abused and over-looked for generations - for a short term cost justification. US EPA is working with the restoration project - to establish a base-line from which to begin. After-all, how can anyone cost effectively fix the cove until after rigorous science identifies the current status. Internship opportunities will exist, as science data collection of the four coves is collected, analyzed, and plans are designed to bring these properties back to a Natural, healthy condition at all levels of the ecosystem complex and throughout the entire food chain. The US EPA will assist and act upon the science gathered - so an Internship at the North Cove may help a high school student get into a good college or university, and higher level research lab work may help under-graduates get into a graduate school - which otherwise may not be possible. The Tidal-estuary restoration begins deep under the mud flats, and continues up to increasingly more complex symbiotic life-systems. This involves over-all systems, and individual wildlife. Helping a single rapture, butterfly along its' migration path may make a salient difference forever more. Plants, animals, water foul, sea creatures - all must be addressed in turn if an overall rehabilitation is hoped to be achieved and preserved. After science has identified the complex elements missing or weak, restoration of the estuary begins : often it is back-breaking manual hard word dirty work - but as the four coves come back to health and behave as a team - a virtual estuary with four tiny (last remaining) shorelines can serve as a much larger estuary, adding diversity of highly specific differences. People learn best by watching others : they learn through example. A prime mission is to educate the community, inspire the children, guide the higher class students - and all involved in restoration will also require science based education. Participation is a community effort - first to stop the generational abuse the community became accustomed to all their life. Members of the community are encouraged to participate as passive members if they must - this is very little to ask for. Other members become placed into internship programs, gain management, administrative, and executive experience. Tuesday, October 29, 2013 is the one year anniversary of hurricane Sandy, a storm that wreaked massive devastation In the United States, with ocean and North Cove estuary water levels 14 foot above mean tide levels at North Cove on the upper Harlem River. Hurricane Sandy impacted 24 states, especially the entire eastern seaboard from Florida to Maine and effects were felt all the way from Appalachian Mountains to Michigan and Wisconsin. New Jersey and New York were hardest hit. Join MWAWA and community members for a Hurricane Sandy Candlelight Vigil at the.North Cove Tuesday, October 29th at 7:45pm. the vital originated on Staten Island and is now expanding throughout the effected coastal region. 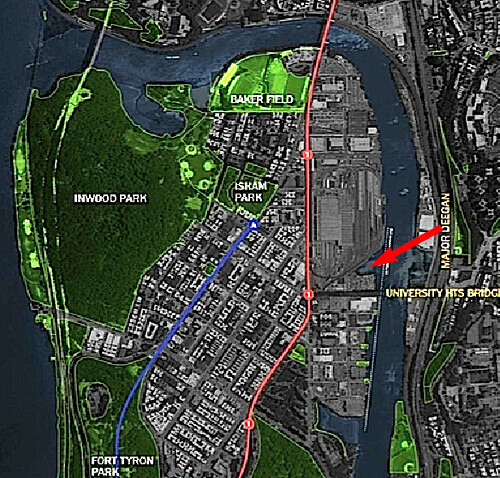 Those wanting to join the Manhattan Wetlands and Wildlife at Inwood North Cove (207th and 9th avenue) vigil at 7:00pm. Please bring your own candles. However we will have a few to share for those who don't have time to buy one. Show your support for all of our neighbors who have been impacted by this disaster,mans talk about preparing for the next one. and visit the North Cove, cleaner, greener,and experience the first of the winter wildlife visitors this migration season. We hope you'll join me on October 29th. Sandy left a mess. Record tides above street level, tides brought in ocean & river debris, but powerful water & wind force flushed the cove of toxins. Sandy helped the North Cove Wildlife Sanctuary. However we had spent a year in preparation. Bird banding is important for studying the movement, survival and behavior of birds. About 60 million birds representing hundreds of species have been banded in North America since 1904. About 4 million bands have been recovered and reported. The North American Bird Banding Program is under the general direction of the U.S. Geological Survey and the Canadian Wildlife Service. Cooperators include the U.S. Fish and Wildlife Service, Mexico's National Commission for the Knowlege and Use of Biodiversity and Secretary of the Environment and Natural Resources; other federal, state and provincial conservation agencies; universities; amateur ornithologists; bird observatories; nature centers; nongovernmental organizations such as Ducks Unlimited and the National Audubon Society; environmental consulting firms and other private sector businesses. However, the most important partner in this cooperative venture is you, the person who voluntarily reported a recovered band. Thank you for your help. One day about four years ago, he was walking down 207th Street. Just before he was about to cross the bridge over the Harlem River, he took a left on Ninth Avenue -- and stopped short. Dead end. Before him was a fence and beyond, the MTA train yard. To his left was a gas station; to his right, an industrial parking lot filled with trucks. Something drew him toward the water. He crossed a smaller, untended parking lot for MTA employees and found himself amid a shanty town of drug addicts, looking out over a small cove. He waded through waist-high garbage and climbed down to the shore to find a few sick geese standing in broken glass. "At that moment, I felt a responsibility to do something," he said. "Everything else was peripheral." He began to pick up shards of glass. Four years later, Mr. Cataldi has filled close to 450 dumpsters full of glass, muck and toxic industrial debris like rusty transmissions and leaking oil cans. The addicts are gone. The birds have returned and brought thousands of friends. This past April, Mr. Cataldi, a shy man with a mission, was recognized by the Environmental Protection Agency for his work at North Cove, one of only 26 individuals and organizations honored across the state for protecting the environment and public health. In describing the transformation of North Cove, EPA officials note that Mr. Cataldi did not wait for permission to begin his restoration work. In fact, for the first eight months, 34th Precinct officers and MTA security called him a trespasser and chased him away. "I came back every day to clean and care for the wildlife," he said. Today, Community Board #12 and the 34th Precinct are supportive. The MTA gives him gloves and access to dumpsters. The garage mechanics, truck drivers and security officers have accepted him, even bringing him drinks on hot days. More importantly, they've stopped dumping trash at the cove. North Cove is far less toxic than it used to be, but garbage still clogs the mudflat. One man can only do so much. Where car parts and rotting trash littered the shore, however, Mr. Cataldi has planted willow trees. Bird sounds fill the air -- flapping, whirring, rustling, twittering, chirping, quacking. As if to remind visitors not to get too swept away by beauty of nature, an A train occasionally screeches to a stop on the other side of the fence -- but the birds aren't bothered. When the tide comes in, happy-go-lucky ducks surf Circle Line wakes toward shore. When the tide is out, hungry geese poke at the mud. Sandpipers chase each other. Egrets drop in for a snack. North Cove is part of the EDC's 2011 Sherman Creek Master Plan, a long-range blueprint to revitalize the Harlem River waterfront in Inwood. Though Mr. Cataldi and Alejandro Baquero Cifuentes, the EDC vice president in charge of the master plan, may not see eye to eye on the future of the cove (EDC's plans include a dock for public recreation; Mr. Cataldi resists the thought of any development), they have only warm words for each other. "His commitment to North Cove is commendable," Mr. Cifuentes said. The EPA's important recognition has validated Mr. Cataldi's quiet work. He is hoping to convert the groundswell of public support into grants and more volunteers, and he's planning a full-blown environmental assessment of the cove, perhaps coordinated with the NY-NJ Harbor & Estuary Program Community Advisory Committee. As he tiptoes into the wider world of NYC environmentalists, he dreams of creating green jobs at the cove with aquaponics. "In the beginning, I thought I was doing it for the wildlife," he said. "Then I realized I was doing it for the people and the city." People are appreciative. "The North Cove effort demonstrates how a modest grassroots project can really help transform a desolate place. We encourage people to step into the stakeholder role, bring vision, bring more people, and help shape the future of our public spaces," said Roger Meyer, Chair of Conservancy North, a new civic organization dedicated to wise stewardship of northern Manhattan's public areas. A successful future for North Cove, Mr. Meyer says, depends on the transition from a solitary effort to a community process. James Cataldi knows that people scratch their heads and wonder why he left Wall Street at the height of his career and is now picking up garbage. In a short video released last week by Colm O'Molloy, a graduate student in journalism at Columbia University, Mr. Cataldi reveals a bit more. "When the World Trade Center came down, it became a time of introspection and a time of reevaluting one's purpose in life," he says. "There's something about saving life, and there's something about saving my little place in the world which is so compelling -- and so horrible. It's a horrible job. But it's the best horrible job that I could find purpose in." 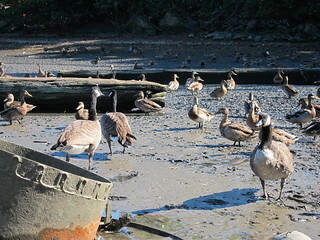 of Inwood's North Cove, and it's resident & migrating waterfowl.